Do Car Solar Battery Chargers Work? Solar battery chargers do work, so long as you don’t expect them to be something that they aren’t. Unlike regular battery chargers that often have multiple amperage settings, solar battery chargers typically put out a very small amount of current that is more useful in maintaining a charge than charging a dead battery. And you’re right to be a little suspect of any charger that only comes with a cigarette light socket adapter, many solar battery chargers also come with alligator clips. Solar battery chargers work by converting energy from the sun to electricity that your battery is capable of storing. This is accomplished by a photovoltaic solar panel, which is the same basic technology you may have seen used in residential and commercial settings to provide off-grid or grid-tied power. In fact, home solar power systems often use lead acid batteries to store power for use at night or on overcast days. Before you get excited, the solar panels used in solar battery chargers are nothing compared to the ones used in residential and commercial solar power systems. While the technology is the same, the solar panels used in solar battery chargers are typically only capable of putting out between about 500 and 1,500 mA. And while you can technically tie multiple chargers together, doing so is dangerous if you aren’t familiar with the technology. Solar battery chargers typically aren’t equipped with regulators, either, which means that if you hook one to a load, it will happily provide whatever it is capable of providing whether it’s actually a good idea or not. Can Solar Battery Chargers Charge Car Batteries? The amount of amperage that a solar battery charger puts out will depend on a variety of factors, including the build quality, how sunny it is, and your latitude. However, they typically put out somewhere in the neighborhood of 500 to 1,500 mA. 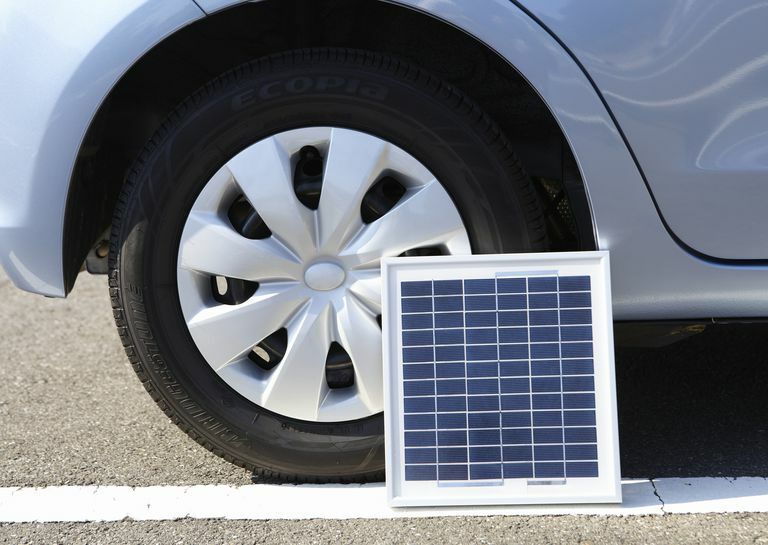 You can find solar chargers that put out more, and panels designed for recreational vehicle use are often capable of putting out a lot more, but a reasonably priced solar charger for car batteries will be in that range. If you’re familiar with trickle chargers, it will be readily apparent that solar battery chargers are indeed capable of charging car batteries. Since that is the general range that trickle chargers typically operate in, there shouldn’t, in theory, be any issue with charging a car battery with a solar charger. One issue is that most of these chargers don’t include a voltage regulator or any way to modify or shut off charging, which means that you may not be able to set and forget it like you can with a trickle charger that includes built-in float monitoring. The other issue is that when you charge a totally dead battery, the best way to do it is to provide more amperage at the start and then ramp it down as the battery charges. High-quality chargers are capable of doing this automatically, and other chargers include manual controls that allow you to set a “course” rate to start and a “fine” rate to finish up. With most solar chargers, what you get is what you get, and if that’s 500 mA or less on a cloudy day in a northern latitude, then it is what it is. If that’s sufficient for your needs, then there’s no reason not to pick up a solar battery charger. But if you want more flexibility, then you’ll want to look elsewhere.